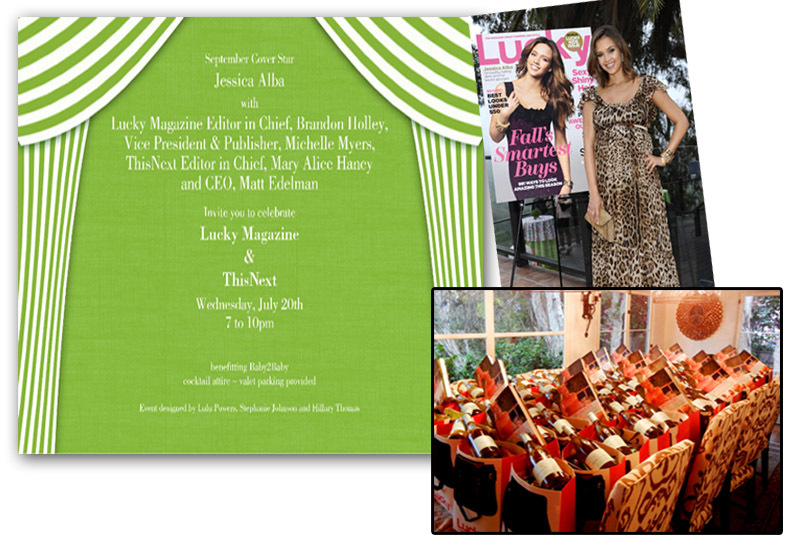 DESTINATION: LUCKY MAGAZINE/THISNEXT PARTY (AND GIVEAWAY)! 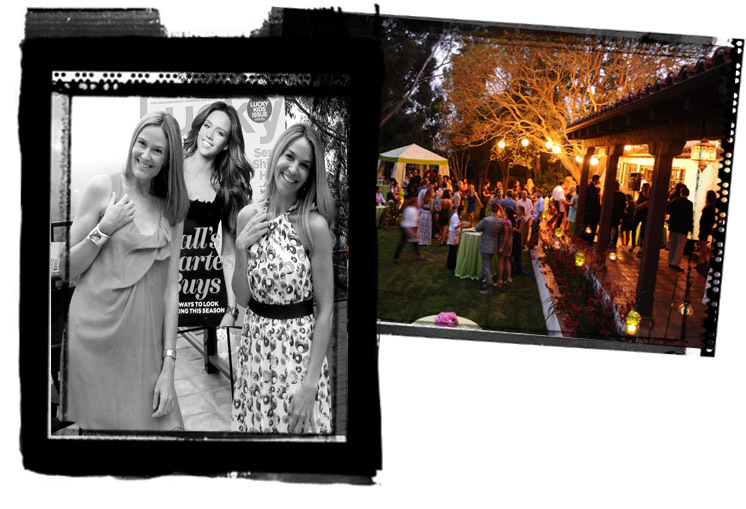 I’m pretty sure there is nothing better than a summer soiree under the stars celebrating with friends. And if those friends include Jessica Alba, you know it’s going to be fun! O.K., Jessica isn’t a friend, but she IS Lucky Magazine’s September cover girl, and together with Matt Edelman (CEO of ThisNext), Brandon Holley (Lucky Editor in Chief), Michelle Myers (Lucky Vice President and Publisher), and Mary Alice Haney (ThisNext Editor in Chief), she hosted the evening. A radiant Jessica (9 months pregnant!) and a host of celebs came out to celebrate ThisNext partnering with Lucky Magazine to be their official ‘shopping’ website. As a contributing editor for ThisNext, I was thrilled to ‘design’ the evening with fellow tastemakers Lulu Powers and Hillary Thomas. Adored the custom tablecloths and wait staff aprons designed by Hillary, and the decor and invite by Lulu. LOVE how the invite mimics the green and white tent used at the event. They don’t call them tastemakers for nothing…! Pretty sure I spent most of the evening hanging by the kitchen door trying to grab delicious Lulu treats before anyone else could try. I don’t know what I loved more, the buttermilk fried chicken tenders, the beef sliders with caramelized onion brioche rolls, or the tuna tar tare on a rice cracker with crispy seaweed and wasabi caviar. Sublime. Our super swag bag included these hot products: Eco Tools brushes, Essie nail polish, Stila lip gloss and bronzer, Always Beautiful Moroccan earrings from Dogeared, Matouk Lemon Fig Verbena Soap, Skincare products from Own and Algenist, and many more! Visit our Facebook page www.facebook.com/SJTraveler and ‘like us.’ Then post a comment stating why you’re feeling LUCKY enough to win the gift bag, i.e., ‘I’m feeling LUCKY because. . .’ We will select one winner at random from the entries on our Facebook page. *Dates of contest: August 24-August 31, 2011. One entry per person. Contest open to U.S.residents only. 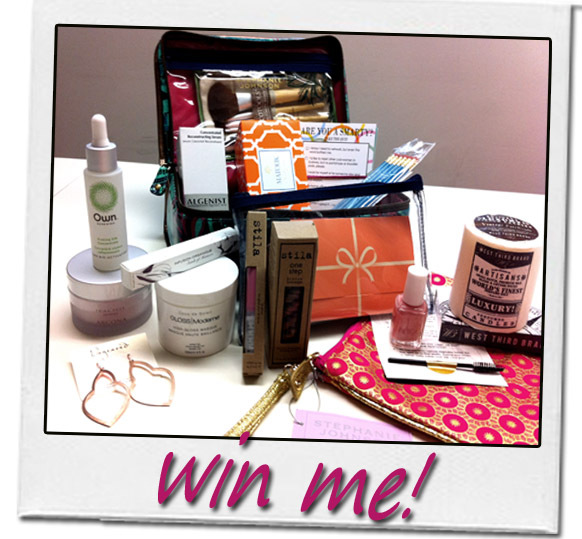 Feeling guilty about receiving such an amazing goodie bag, or just want to do something rewarding (to give back) today? Check out www.baby2baby.org, a favorite charity of Jessica’s (and ours!) that puts needed baby stuff in the hands of those that need it most, and make a donation. What an amazing giveaway! Definitely a very, very Lucky winner!! because I just found a four leaf clover..
I’ve got a rabbit’s foot on my keychain..
with all this luck, how could I ever complain? ?